Primary Care Doctor Opportunity: Bristol Rhode Island - Full or Part-time. Medical Associates of Rhode Island is seeking a new physician to join their Bristol Rhode Island Practice. Serving Rhode Islanders since 1963. We are a collegial group of 14 Internal Medicine Physicians. Primary Care Outpatient Practice, EMR is E-Clinical, Call is two times a month, see 15-17 Patients a day. Working with a great group of professionals and living in such a beautiful area is a dream come true. You will experience the freedom of being an independent doctor; taking over an established panel of patients while working in a quintessential New England waterfront town. Full Package of Benefits: Competitive Salary, Production Bonuses, Medical and Life Insurance, Four Weeks of Personal time off, plus six holidays, 5 CEU days, 401K with 3% matching, Malpractice Insurance, Equity Tract (partnership) with Tremendous Growth Opportunity, 5K Signing Bonus and up to 10K in relocation cost. We offer other ancillary options if you would like to earn more. Qualified candidates must be Board Certified or Board Eligible in Internal Medicine or Family Medicine, MD or DO, with a current Rhode Island Medical License. We also offer Pediatrics, Long Term Care, Dermatology, Bone Mineral Density, CT-Scan, Eye-Care, Laboratory, Physical Therapy, Podiatry, Radiology, and a Walk-In Center that is available for routine and Urgent Care. We bring in specialist two times per month. Affiliated with the Rhode Island Hospital, and our staff teaches at the Warren Alpert School of Medicine Residency Program. 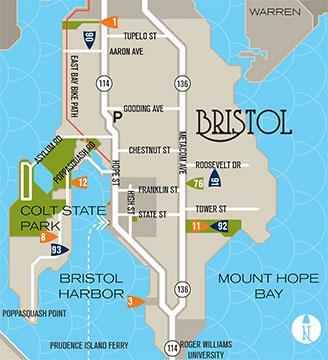 Created in 1685, Bristol embraces its three centuries of rich history which includes being the site of a landmark battle, as a sailing and shipbuilding hub, a critical Colonial Era port and all the while continuing to have the distinction of hosting the oldest, continuous Fourth of July Celebration in America.